Looking for a light snack that won’t make you shudder with guilt? 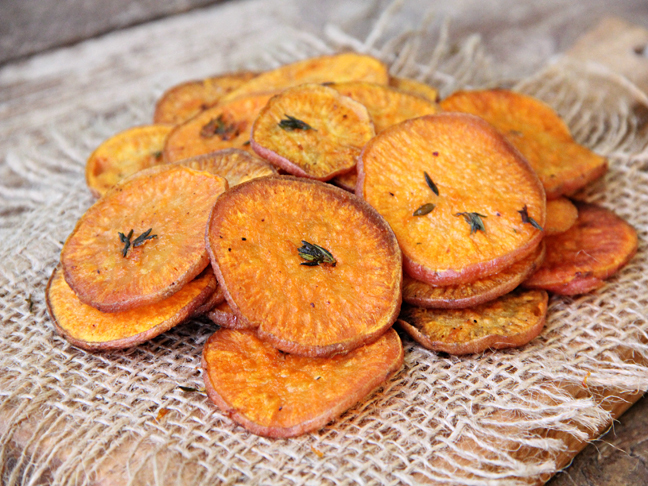 In 30 minutes, you can have a batch of deliciously seasoned, guilt-free, baked Sweet Potato Chips. This potato recipe is perfect for your superbowl party, or an afternoon at home with your kids. You can even make this recipe as after-school snack! Step1: Preheat oven to 350. Lightly grease two baking sheets and set aside. Step 2: Thoroughly wash and scrub sweet potato. 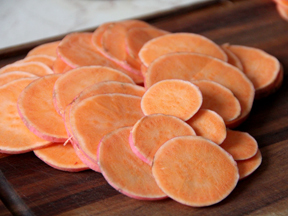 Step 3: Slice sweet potato using a mandolin, or a very sharp knife. 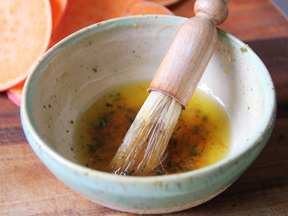 Step 4: In a small bowl, mix together olive oil, orange zest, thyme leaves, sea salt, and black pepper. 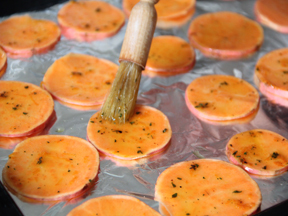 Step 5: Evenly place sweet potato rounds on baking sheets, making sure not to overlap. Step 6: Generously brush tops of sweet potato rounds with olive oil mixture. Step 7: Bake the first batch for 20 minutes, or until golden brown and centers are dry. Bake the second batch. Allow chips to reach room temp before serving. Tip: For alternative chip seasonings, try: cinnamon-spice, cayenne-sea salt, cumin, and rosemary-garlic. 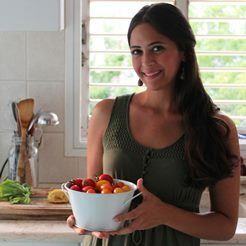 Get more mouthwatering recipes from Karen Biton-Cohen at K. abc Food & Photography.